Pragmatists have traditionally been enemies of representationalism but friends of naturalism, at least if the latter is understood in the sense of Hume and Nietzsche, as naturalism about human subjects. In these classes, Huw Price presents his version of this traditional combination, situating it both in opposition to other forms of contemporary philosophical naturalism, and in comparison to other pragmatist and neo-pragmatist views, such as those of Brandom and Blackburn. The classes will be based on the material in Price’s forthcoming volume Three Themes in Contemporary Pragmatism (Cambridge University Press, 2012), itself based on his René Descartes Lectures, Tilburg, 2008, with commentary essays by Simon Blackburn, Robert Brandom, Paul Horwich and Michael Williams. Huw Price is ARC Federation Fellow and Challis Professor of Philosophy at the University of Sydney, where he heads the Centre for Time in the Department of Philosophy, SOPHI. He was previously Professor of Logic and Metaphysics at the University of Edinburgh, and has recently been elected Bertrand Russell Professor of Philosophy at the University of Cambridge, to succeed Simon Blackburn. His publications include Facts and the Function of Truth (Blackwell, 1988; 2nd. edn. OUP, forthcoming), Time’s Arrow and Archimedes’ Point (OUP, 1996), and a range of articles in journals such as Nature, The Journal of Philosophy, Mind and The British Journal for the Philosophy of Science. A collection of his essays on pragmatism and naturalism, entitled Naturalism Without Mirrors, has just been published by OUP; and he is also co-editor (with Richard Corry) of Causation, Physics, and the Constitution of Reality: Russell’s Republic Revisited(OUP, 2007). For more information, see http://homepage.mac.com/huw.price/. Students from the University of Helsinki are required to enroll to the course using WebOodi. Students from other universities are required to enroll to the course by sending an email to info@nordprag.org by 1 September 2011. The students can complete the course by participating in a written exam (3 credits) and/or writing essays. The written exam takes place at Aleksanterinkatu 7, lecture room 6, on 16 September at 12.00-14.00. Essays should be ca. 8 or 12 pages long (for 2 and 3 credits, respectively, approximately 300 words / page). Send your essays to henrik.rydenfelt(at)helsinki.fi by 14 October. 6. Suggest a topic and then upon approval write an essay on that topic! Simon Blackburn: Pragmatism: All or Some? 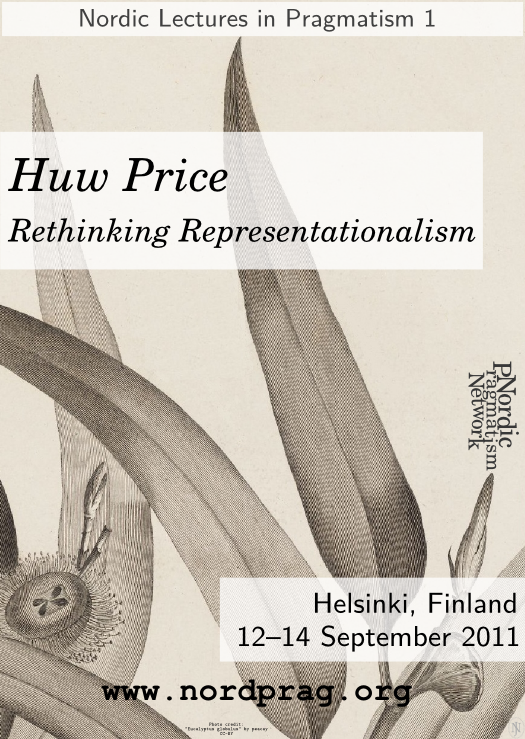 Huw Price: From Quasirealism to Global Expressivism – and Back Again?